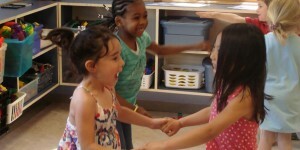 Every day at Foundations for Learning Child Care, we see children who struggle to fit in or make friends; who come off as aggressive or overly sensitive – making it a challenge for them to fully interact with others their age. While no parent likes to think of their child as being socially awkward or has having no friends, it is the parents that can have the biggest impact on whether or not their child can act positively in social situations. By providing a good example and by following these few basic tips, you can help to ensure that your kids are more socially adept and able to shine in preschool or day care situations. Earliest communication skills are learned at home. Teaching children to engage in polite conversation and by displaying higher levels of engaged conversation and active listening teaches children how to engage with peers better. Avoid competition. For children struggling to make friends, competitive games can be a catalyst for rude or aggressive behavior. Engage children in cooperative play instead to foster open relationships where they work towards a common goal. Teach young children how to read facial expressions in order to help foster empathy and concern for others. Practice authoritative parenting. By acting with self-control, warmth and support towards your child, rather than diminishing or trivializing negative emotions, will help your child to learn how to do that for him/herself. As the top-rated local® child care we work closely with every parent to ensure that their child is happy, healthy and thriving. At Foundations for Learning in South Windsor, we strive to foster healthy relationships between all of the children at our child development centers.